Lindsey Lee is an actor and presenter. She trained in acting at the Arts Educational schools, London. Her first television job on graduating was Eastenders , followed by her theatrical debut on London's West End with the Soho Theatre Company. Lindsey Lee has appeared in a number of theatre productions including Ruth in Seven (Birmingham Repertory Company), Dierdre in Bold Girls (Rapture), Jan in Marilyn Painted Pictures (Spartaki) and Barbara Cahoun in The Happiest Days of Our Life (Windsor Theatre Royal). Her TV credits include Lizzie in Garrow's Law (BBC/Shed Productions), Dr McLeod in River City (BBC), Sandra Mailer in Taggart (STV), Tanya in Rockface (BBC) and Ann in Eastenders (BBC). Lindsey returns to the role in 2015 and is looking forward to farting on a daily basis at Sweet Venues in the Grassmarket. Arron Usher studied a BA in Acting at Queen Margaret University, Edinburgh. His Theatre credits include Bob Cratchit in A Christmas Carol (MacRobert Arts Centre), Silly Billy in Jack & the Beanstalk (Eden Court), Daft Jamie in Sleeping Beauty (Brunton Theatre), Callum Patterson in Silence in Court (EmeraldBlue Productions), Buttons in Cinderella (Alhambra Theatre), Douglas in One Elliot Park (Siege Perilous Productions), Gary Oliver in And They Played Shang-a-Lang (Craft Theatre Company) and Dennis Nilsen in Killers by Taggart creator Glenn Chandler. In 2014, Arron starred with Susan Penhaligon and Katy Manning in Keeping Up With the Joans (Greenwich Theatre). TV/Film credits include Young Brian Burnett in Gingernuts (STV), Soldier in King Jamie & The Angel (Channel 4), Mr Alexander in Night is Day (Silly Wee Films) and Andrew in Wind Over Lake (Imagine Pictures). After a successful run in 2013, Arron returns in the role of Guffy in Princess Pumpalot: The Farting Princess at this year's Edinburgh Festival Fringe. Edward Cory studied drama at Edinburgh's Queen Margaret University, graduating in 1986. Since then he has appeared from Dornoch to Bognor Regis, Norwich to Taunton in varied productions including Mr Oxenby in The Dresser (British Actors Theatre Company), Baron Carberry de Scissor in Cinderella (Brunton Theatre), Count Alucard in Sleeping Beauty (Brunton Theatre), Herbert Vole in Sequence of Events (EmeraldBlue Productions), and Ian Brady in Taggart creator Glenn Chandler's Killers . TV work includes roles in Taggart , Albert and the Lion , Winners and Losers , and A View From Harold Clark . After successful runs in 2013 and 2014, Edward is delighted to return as the King in this year's production of Princess Pumpalot: The Farting Princess . Donna, a Fifer, broke into professional theatre after winning Channel 4's TV show Musicality in 2004. Subsequently, she has appeared as Mama Morton in the hit West End production of Chicago at The Adelphi. Following that, Donna performed at the Olivier Awards back in 2005. Her extensive Theatre credits include UK, European and International tours including Barbara Cassidy in Over The Rainbow - The Eva Cassidy Story (Theatre Productions UK Tour) Lisa in Girls Night and Lois in Girls Behind (Goodnights Entertainments), Best Of Musicals (Gastspeil Gerhartz Europe). A particular highlight was playing Mother Abbess in The Sound Of Music (Popular Productions) in Dubai. Donna also keeps busy as a principal soloist in A Song, A Sip and A Sandwich at various venues throughout Scotland and has toured with the musical comedy I Will Survive (InsideOut Productions). 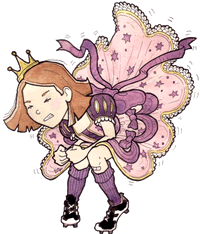 She is delighted to be returning as the Queen in Princess Pumpalot: The Farting Princess at the 2015 Edinburgh Festival Fringe. Since completing training in London, Brett has enjoyed a varied career in theatre performance, directing, writing, producing and technical elements alongside experiences in film and television. His passion lies in theatre and its power to move, educate and entertain audiences. His theatre credits include The Virgin's Guide to Rocky Horror (emeraldBLUE Productions), Rent (Craft Theatre Company, EMT, GMT and Nederlander Workshop), Sweeney Todd (EMT), How To Succeed In Business Without Really Trying (EMT), Boogie Nights The Musical (EMT), Let Us Entertain You (Showcase Musical Productions), And They Played Shang-A-Lang (Craft Theatre Productions), and Sunshine on Leith (Captivate Theatre Productions). Brett is thrilled to be marking his 15th year of performing at the Edinburgh Festival Fringe by returning to the role of Prince Nastavia, a character he originated in 2013. He is looking forward to being bad. Very ... very bad. David Mairs is a professional actor, singer and musician. He studied BA (Hons) degree in Musical Theatre from New College Lanarkshire, affiliated with Northumbria University. From a very early age David started singing with the Glasgow Youth Choir. Since then, he's appeared in a number of productions including Broadway in the Bar (Inside out Productions/Arta Glasgow), Songs for a New World (Gillian McLaren Scott/SWG3), Grease (Alan Currie/Hamilton Town House) and Sleeping Beauty (Richard Gray/Hamilton Town House, Rutherglen Town Hall). David moved to New York City in the summer of 2014 to attend an international intensive study program at Steps on Broadway where he managed to hone his dancing skills. David is perhaps best known as a member of top One Direction tribute band - One and Only Direction. David is looking forward to playing Prince Niceavia in the 2015 production of Princess Pumpalot: The Farting Princess . Cameron plays a number of historical characters with Edinburgh's Cadies & Witchery Tours including the highwayman Adam Lyal. As a result of this work, he's featured on numerous national and international TV and radio shows. His film credits include Georgian Edinburgh , St Andrews: Ghosts, Gowns and Golfers and Ghosts of Scotland . Cameron's Previous Edinburgh Fringe performances have been with the inclusive and voluntary drama group The Radicals. The plays produced were: David Hume: Citizen of the World (2006), Socrates: Last Days and Legacy (2006), Jeremy Bentham: The Pursuit of Happiness (2007), Adam Smith: Making Poverty History (2008), and Robert Burns: Scotland's Radically Enlightened Poet (2009). Cameron is thrilled to be performing the role of the Dungeon Ghost, FAQ, in Princess Pumpalot: The Farting Princess at this year's Edinburgh Festival Fringe. Andrew T. Henderson returns as Geoffrey The Giraffe and the Low-Flying Gnome after his successful appearance in the 2013 production of Princess Pumpalot: The Farting Princess . Andrew has played a number of historical characters on Edinburgh's long running Witchery Tours, including Alexander Clapperton on The Ghost & Gore Tour and Adam Lyal (deceased) on The Murder & Mystery Tour . In 2011, Andrew appeared as Andrew Norris in Leitheatre's Specter and as Tom in Accrington Pals (Churchill Theatre, Edinburgh). His film work includes playing The Film Student in the feature film Finding Bob McArthur (Freedonia Films, 2007) with Maureen Beattie and John Stahl and directing the BAFTA nominated short documentary The Rest Is Silence (2005). If those weren't enough strings to Andrew's bow, he also acts as the Production Designer on the show creating the set, designing the props and building our nine foot giraffe.